These days, weвЂ™re constantly bombarded with trendy, restrictive diets that instruct us to вЂњEat only thisвЂќ or вЂњGive up thatвЂќвЂ”diets that ultimately fail when you find that you canвЂ™t sacrifice the foods you love. 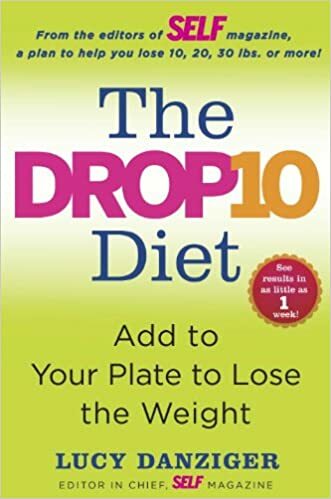 But now you can lose weight without deprivation: Lucy Danziger, editor in chief of SELF magazine, and her team of nutrition experts have created the ultimate flexible plan for melting off ten, twenty, or more pounds at any ageвЂ”you can see results in as little as a week! By eating more of thirty superfoodsвЂ”everyday favorites like eggs, yogurt, steak, Parmesan, cherries, kiwi fruit, dark chocolate, and coffee (yes, chocolate and coffee! )вЂ”you can shed weight while naturally reducing your dependence on less healthful foods, lowering your risk for diabetes, heart disease, cancer, inflammation, and more. The food plan has room for all your canвЂ™t-resist treatsвЂ”you can eat them and still slim down! вЂў 101 quick, tasty breakfasts, lunches, snacks, and dinners. You choose your favorites. Each meal or snack incorporates at least one Drop 10 superfood and leaves your cravings and your stomach satisfied! вЂў 40 delicious family recipes that even a novice cook can fix. Your loved ones will never know theyвЂ™re eating healthfully! вЂў 1,400 extra вЂњhappy caloriesвЂќ each week to enjoy on top of your Drop 10 meals and snacks. Use your happy calories for daily splurges (ice cream!) or save them up to spend for a big night out (Mexican? Bring on the nachos!). вЂў 8 exercises you can do at home or in the gym to boost your metabolism and supercharge your weight loss. вЂў Inspirational stories of weight loss from women just like you! DonвЂ™t waste another bite on bland, strict diets that donвЂ™t work. ItвЂ™s time to grab life by the fork!